A double knit hat for the boyfriend. Fichu? I hardly know you! Are you interested learning Cast on’s? Earlier this, I was talking to some one about an unpleasant experience I had with an on-line bookstore—some 3 or 4 years ago. It’s wasn’t horrid—just annoying. I ordered a book—The Vogue Knitting Book—(along with some other books) –but the other books were go alongs. Oh, and by the way, the Vogue book is temporally out of stock-- It will be shipped (at NO additional charge) in a few days. A week passes (the other books arrived) and I get a second email.. there is still no Vogue in stock. Do I want to continue to wait or a refund? I opted to continue to wait—again, and again. Until finally they sent me a notice, about being unable to fulfill my order, and sent me a refund. I was happy that I didn’t lose my money, but I really wanted the book. Soon after that, my finances changed (for the worse) and while I wasn’t living in poverty, I was more conscious of spending money-- and well, I wanted the Vogue book, but with 45 + years of knitting, and over 50 knitting books on the shelf, I hardly needed it. In the past few years, I received some Barnes & Noble gift cards (usually a $25 one)--and when I had some extra money (to pay for the $40 book) they didn't have it stock. So I've bought other books. What a surprise then—to unwrap an unexpected Christmas present—and find Vogue Knitting! I am a bit tired today—I stayed up long past my bed time, looking at the detail. It’s a wonderful book—and as much as I know about knitting, I know it still has things to teach me. Not mine, but my daughters boyfriend. So a hat in school colors will be worn a few times a year –stash yarn, and no real pattern, just some stripes and chevrons…the sort of thing I can almost knit in my sleep –but not quite—and its just enough of a gift. I was 3 rounds into the chevron before I realized one group of 8 was really a group of 7, and other group of 8 was a group of 9. I don’t have any project patterns—unless you consider the over sized swatches that I call pot holders. Once you get double knitting, its not hard to use any charted or written out pattern –somethings, (lace and cables) are a Major PITA—but who needs cables or lace with color work? And double knitting color work is much easier than almost any other kind of color work. There is a double knitting group on Ravelry, and several free patterns for hats, scarves and other items—should you want. (there are plenty of patterns for sale, too. The lack of patterns (even with Ravelry, there just aren’t that many) and the somewhat rarity of double knitting has interesting repercussions. Every knitter who want to double knit, find a just a little info.. and works out many of the details for them selves. So there are lots of idea on how to cast on.. (I listed 3 in my tutorial, but since Ravelry, I ‘learned’ a dozen more ideas (most double knit cast ons are just modified versions of conventional cast on’s. Like my hat..First I tried something I thought would work… I tied 2 yarns together, and then used Judy’s magic cast on. It can be done.. but UGH! I undid it, and then did an “Italian cast on” using both colors of yarn (as I do in my YouTube Video) –but after the cast, I continued to work with both yarns. A nice neat edge—with plenty of stretch. Knitting in the round, I didn’t have to think about selvage edges.. but likewise, there are many ideas for selvages on Ravelry, too. It seems every one who has learned double knitting has worked out method for neat edges. Its fun to learn all these tricks—some work better than others,but all have there uses. Part 7—Scandinavian 2 yarn, Single Color Double Knitting. Is there anything more wonderful then finding a soft brown package in the mail? Especially when the brown package is an unexpected and delightful gift of beautiful yarn? Yes. Plus 3 skeins of Mohair, in summer sky blue, and 1 more in the softest of lilacs. Each skein is only 25 grams, but the mohair is soft and fine.. Not quite as soft as Rowans kid mohair, but a very close second. (The lilac yarn is 100% (something! ), the sky blue, a 70%/30% blend of something--the something is in Japanese, and my kongi is.. well lacking! One of my Ravelry (and real life) friends spend time in Japan, perhaps she'll be able to identify/read the labels. But as beautiful as the yarn is, it is the warm wish from sister with whom relations had become chilled that make this package even more wonderful. The spiritual warmth is more wonderful that the physical warmth the wools will bring. It’s only fitting. She has warmed my heart, I will warm her, too… (likely her neck and hands with a soft neck warmer and some fingerless gloves, made from the dark red chunky wool. People who know me, know, I haven’t owned a winter coat for that past few years. It’s not poverty—it’s a choice. Once it goes below freezing, I often, but not always, wear a hat and gloves. My gloves got a work out over the weekend.. snow and ice—and shoveling off (and out) my car (which is always parked on the street) required gloves--especially because it was either snowing or there was freezing rain. Temp’s have been hitting HIGH’s of 19° F—or about -5°c— and it’s been even colder at night. The real problem hasn’t been the cold, it’s been the wind. 10 to 20 mph sustained winds, with gusts up to 40mph—they are just nasty! It’s too bad there is all this bad weather this week…(and really in NYC this is exceptional—usually its just coldish (close to freezing during the day, just below freezing at night) –because Boyfriend (daughter's boyfriend, that is) is going to be getting a really warm hat, NEXT week. It’s a double knit one, with a deep fold back cuff (just finished) . Eventually I’ll do some pattern work on the top--nothing to fancy.—just something to inter lock the layers. Daughter looks at the blog—occasionaly--but I seriously doubt he does--ever. And she won’t tell.. so you can see the progress! It's what I have been knitting... and finished last night. But is a secret project... so all you are going to get is this blurry image. If you are a Raveler, you can check out the details here. And see the whole finished project! I am working on another semi secret project--something for my daughters boyfriend--Oh the knitting I've done for all of them, over the years. I've already knit an inch.. (since 9PM or so last night.) Hats, even double knit hats, are fast work! Yesterday, my plan was, after work, to drive down town and see Robyn Love's crochet pencil. Life (life, that is, as lived in NYC ) interfered. In my photo's taken after 4:30 PM, you can barely make it out.. (what a shame they didn't spring for generator, or some spotlights for the night..
My fingers flew, and loved every minute. Tonight I’ll finish up the armhole bands, weave in the last thread or two, and it will be 100% done. It looks so small compared to the sweater—but looks are deceiving. easily pull your arms out of the sleeves, and cuddly yourself inside. It was knit in the round. I never bother making any special effort for a jogless join.. I did make a point of ending each round with a purl, and the jog is mostly hidden in the recessed purl. Tubular bind off--cause well, anything that hangs around your face should be pretty. (the armholes will get a tubular bind off too. I would like to teach a class on cast on’s--and may have an opportunity. In fact, if there is enough interest, I might have 2 classes—one in Manhattan, and one in western Suffolk County(LI). If you are intererested, could you send me an email? Send it to TroysGoldenApplesATgmailDOTcom—subbing an @ sign and . for the AT and DOT. Also, if you could also answer these questions, (and add comments, too) it would help me a lot! How many cast on’s would you like to learn? How long should the class be? How big or small should the class be? Would you be willing to pay more for a smaller (under 10) class? Are you in the NYC/LI area? I am not big on cutesy. Cute is Ok once in a while, but cutesy, or twee, or what ever you call it, just isn't for me. These are paired sweaters, clearly. They share the same yarn, in the same colors. They both are raglan sleeved, and both feature stripes.. But they are clearly siblings, (and for siblings! But not a cutesy pair. 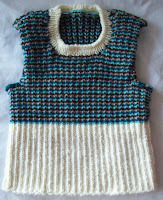 Miss B is going to get a ribbed snug fitting vest, too, because you are never too young for a sweater set. --and some finger gloves that co-ordinate (they don't really match--the brown is lighter, the aqua is a fuzzy angora blend), too. The sweater is loose, with deep arm holes.. the kind of sweater that you can easily pull your arms out of the sleeves and into the body --the vest will be snug fitting.. One style or the other is bound to be liked. Miss C's sweater still needs some buttons-and a good blocking, but last night all the ends were finished--finally! Now, the hope is that they are liked. Kids can be so picky! Miss B was recently seen in a sweater that is several (5 or so!) years old.. it barely fit.. I doubt it could be buttoned, and the sleeves were no longer long, (they ended at the elbow!) but I am guessing Mother said "It's a bit chilly, but on a sweater" and left Miss C to her own choice. I am happy that she chose something I knit for her... maybe the next sweater I knit for her will be an other (larger) version of the same sweater. and maybe she'll wear it.. or mayb not! Labels: Master C's sweater, Miss B's sweater. But it's looking like a sweater. There are still untold tails to weave in.. (a nice detail of the stripe on the shoulder is 3 rows of contrast, 4 rows of main color (the dark teal), and seams (under the arm) to sew up. 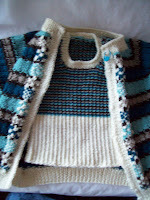 Not to mention the plackard and neckband to knit! It really looks nice.. it has the right balance of color. Knit in the round, odd numbers in rows are fine—but intarsia is a pain. 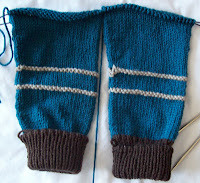 Knit flat, the intarsia (sleeves) are snap—but 3 rows of color.. a drag! I am toying with the placket and neck band. At this point. The plan is to knit them as one, with mitered corners. And a tubular cast off --in brown. But today, as I head out to West Babylon and join my friends there, the plan is to weave and seam (the underarms) and then later this week, finish up the neck edge. The sleeves have been joined to the front and back and the front has been split for the placard. Yes, the back looks longer than the front—and it is—I've already added the short rows that make knit this type of sweater fit better. And Yes, it is slightly insane knitting, with 5 balls of yarn at work—2 for the front, 2 for the sleeves, and 1 more for the back—and in a round or two, it will get crazier still when I add 2 more balls of yarn to knit some stripes to the sleeves. But I am liking how it looks, and like each row better—since each row is shorter! I am, also (deservedly so, I think) in inordinately proud of what is not there. The transition from knitting in the round to knitting flat is often marked by a change is gauge. Most knitters purl ever so,(or marked so, or some where in between) a little looser than they knit. And changing from an all knit fabric (round) to a knit and purl fabric can be conspicuous—at least before blocking. Old NY joke--Man get's in a cab, and ask the driver "Do you know how to get to Carnegie Hall?" The Mast socks haven't seen too much progress. I am past the point where I frogged them. And actually beginning to think about heel styling and shaping.. The front of the sock is worked in a lace stitch..
Can you see the design? Does the name make any sort of sense (yet)? No matter! It makes sense to me! But quickly approaching that point. The body is over 6 inches long, (and a size 3 is just 12 inches from neck to waist) so we are almost half way done with the body. A few more inches, and the sleeves will be joined, and the raglan shaping started. This is only my second bottom up raglan, and I like it. The sleeves—to me the most tedious part—get knit first. And the top yoke is all decreases—as you near the end, each row has fewer stitches to work—really when you think about it—its perfect! The cuffs have a tubular cast on. The body, a long tail variation with a double tail—it makes a sturdy, firm but stretch edge. The neck line will be a tubular bind off, since I really like that detail on a neck edge. And the neck edge will be white, not brown. My subway knitting is my Mast socks--and my plan yesterday was to work on weaving in the remaining tail of Miss B's sweater... but like many a plan, it went awry. Oh well. Miss B's sweater isn't finished. There are still ends to be woven in, buttons to make and sew on. But Master C's is started-- 9 and half inches of sleeves, (11.5 actually –when the cuffs are unfolded)--complete with a tubular cast on for the sleeve. Yesterday, I cast on for the body. It will also have dark brown ribbing, but the light tan brown for the body-- a style not uncommon for sports shirts with dark sleeves and contrasting color body. The top yoke will be a raglan sleeve, with simple stripes, and a henlee type front opening—I know I hate things tight (or even loose!) around my neck, and judging from photo's, my grandchildren agree. They are always runny about with jackets or sweaters undone (or half off)--the are healthy. Their parents are pretty good at finding a compromise between indifference and hovering—DIL lays down the lay—Jackets on! But doesn't fight about buttoning them up. I think an open neckline is a good choice. Beside its easier to pull on and off--an important style factor for clothing for 3 year olds.